Robert Kuttner currently teaches two courses at the Heller School, on Globalization and Democracy; and on the Political Economy of the American Welfare State. He has also taught at Boston University, The University of Massachusetts, the University of Oregon, and at Harvard's Institute of Politics. For most of his career, he has been an economics journalist. Robert Kuttner is co-founder and co-editor of The American Prospect magazine, He was a longtime columnist for BusinessWeek, and continues to write columns for Huffington Post, The Boston Globe, and The New York Times international edition. He was a founder of the Economic Policy Institute and serves on its board. 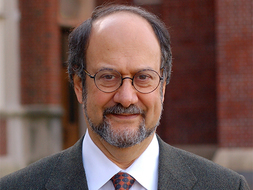 Kuttner is author of ten books, including the 2008 New York Times bestseller, Obama's Challenge: American's Economic Crisis and the Power of a Transformative Presidency. His best-known earlier book is Everything for Sale: the Virtues and Limits of Markets (1997). His other books on economics and politics include: The Squandering of America (2007), The End of Laissez-Faire (1991); The Life of the Party (1987); The Economic Illusion (1984); Revolt of the Haves (1980), and Debtors’ Prison (2013). He is completing a book in globalization for publication in 2017. Kuttner’s other writing has appeared in The New York Times Magazine and Book Review, The Atlantic, The New Republic, The New Yorker, Dissent, Foreign Affairs, New Statesman, Columbia Journalism Review, Political Science Quarterly, and Harvard Business Review. He has contributed major articles to The New England Journal of Medicine as a national policy correspondent. His other positions have included national staff writer and columnist on The Washington Post, chief investigator of the U.S. Senate Banking Committee, executive director of President Carter’s National Commission on Neighborhoods, and economics editor of The New Republic. He is the two-time winner of the Sidney Hillman Journalism Award, the John Hancock Award for Business and Financial Writing, the Jack London Award for Labor Writing, and the Paul Hoffman Award of the United Nations Development Program for his lifetime work on economic efficiency and social justice. He has been a Guggenheim Fellow, Woodrow Wilson Fellow, German Marshall Fund Fellow, and John F. Kennedy Fellow. Kuttner's journalism and scholarly research has been at the intersection of economic and politics. His current research is on the impact of globalization on political democracy at the level of the nation state; and on possible alternatives to the current structure of the economy that would be more conducive to greater equality of income, wealth, and opportunity as well as to stronger democracy. Robert Kuttner was educated at Oberlin College (A.B), The London School of Economics, and the University of California at Berkeley (M.A). He holds an honorary doctorate from Swarthmore College. Kuttner, Robert,. Debtors' Prison: the Politics of Austerity versus Possibility.. Vintage/Random House, 2016.